Artículo 68. Los ciudadanos y ciudadanas tienen derecho a manifestar, pacíficamente y sin armas, sin otros requisitos que los que establezca la ley. Se prohíbe el uso de armas de fuego y sustancias tóxicas en el control de manifestaciones pacíficas. La ley regulará la actuación de los cuerpos policiales y de seguridad en el control del orden público. Article 68: The citizens have the right to protest peacefully and without weapons, without any other requirements than those established by law. The use of firearms and toxic substances in the control of peaceful demonstrations is forbidden. The law will regulate the conduct of police and security bodies in the control of public order. The bold in the translation is mine. What the article says is very clear: People can protest and there are laws that limitwhat the police bad security bodies can do. But the armed forces are not a security body and a law can only be approved by the National. These regulations clearly violate the Constitution, it is not a law, because the Minister of Defense does not approve laws, even if his name is Godfather and because according to the Venezuelan Constitution, the Armed Forces are not part of the security forces. The Interamerican Commission on Human Rights has explicitly banned the use of the Armed Forces on matters of internal security, explicitly stating that the military should only participate when national security matters are involved. “The Armed Forces will have methods and means that will allow the equipment and permanent training of the military personnel for the progressive and differentiated use of force…and the use of force as situational punishment . I could go on, but I would throw up. The Maduro Government just created the “legal” instrument to keep using the same force in repressing protests. Because once the Government begins getting less than US$ 50 per barrel, the “people” are going to be very pissed and force (no limits! It’s legal!) will be used.. There is nothing “disguised” about this Dictatorship…now that oil does not guarantee their survival, repression will. Or might? It has now been a week since Maduro’s “announcements” and we have heard little about the supposed details of the new foreign exchange regime. It is as if the Government had no sense of the crisis that is coming, taking its time, Maduro traveling and not a single positive sign in the horizon. This morning, I heard a conference call by a small country, in which its Minister of Finance and some representatives of its Central Bank participated. The presentation was concise, to the point, using numbers and then the whole thing was open to discussion. Very professional, very informative, it certainly improved my opinion about that country’s bonds. This is in contrast with the attitude of the Venezuelan Government. Even when it had professionals handling the Government finances, Giordani set the tone that the Government would not meet with investors and markets should be surprised, not informed. But now that the Government is in a crisis (and has no economics professionals), it continues with its attitude, not only not talking to investors, but sending the worst possible signals to them, at a time that the Government should be trying to reach out to markets. PDVSA has to publish before the 15th. of January a report on its consolidated debt. It did so this year and surprise, surprise, it turns out that PDVSA issued a new bond three months ago, without telling anyone about it…until now. Yeap, in page 12 of the report, it says that on Oct. 28th. it issued US$ 3 billion of a bond with a 6% coupon and a maturity in the year 2022. The bond has not hit the markets yet, but the company’s debt did increase and investors took three months to find out about it. Not precisely a friendly gesture. 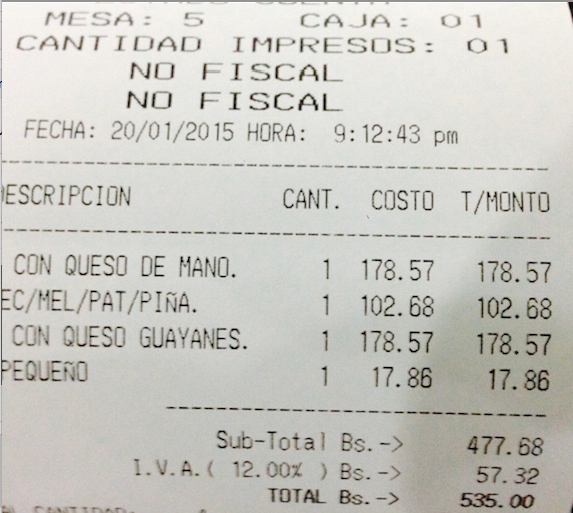 In fact, it looks like this transaction was made in order to pay the maturity of the PDVSA 2014 issue. That is, PDVSA did not have all the money it needed to pay that issue. Not a nice thing to do to investors. Citgo Petroleum issued last year a bond in the amount of US$ 650 million with a coupon of 6.25% and at 100% of its face value. This bond had covenants (conditions) that limited that the company could issue more debt. But last week we learned that Citgo is not only issuing new debt, but also issuing a loan. Except it is not Citgo Petroleum that is doing so, but Citgo Holdings, a newly created (Did not exist on Dec. 31st) affiliate that now owns the shares of Citgo and some property that was transferred to it. The new bond and loan will be guaranteed with this property as well as 49% of the shares of Citgo. Well, those holding the old Citgo bonds issued in 2014, found themselves losing close to ten points overnight when this was announced. The new notes are expected to yield more than the old ones. Investors must not be happy, they were essentially blindsided. Thus, rather than trying to improve relations with investors at a time that the Government may need them, when and if there is a default, the Government takes the opposite road. It does not tell them what it is doing and it makes them lose money. I would really like to listen in to these talks Maduro had in China, Saudi Arabia and the like in his last trip. I just wonder what is their attitude when they talk to those investors. If it is anything like the entitlement attitude they have with current bond investors, I don’t believe for a minute that Maduro got much in his trip. After postponing his “announcements” for a while due to his Magical Mystery Tour, President Maduro finally had time to come back to Venezuela and give his also twice postponed State of the Union address, where we were supposed to hear his new “program” for the economy. In the end, there were few details on what he plans to do with the foreign exchange, while very specific plans to spend even more. -Food and medicines will be kept at Bs. 6.3 per US$. This is obviously a #FAIL, as the implicit exchange rate stands at Bs. 97 per US$ and the Government will devalue the other two rates to factors of even more than ten times this level, which opens up for corruption, arbitrage and smuggling to Colombia everything imported to Venezuela at this price. -A second rate, lets call it Sicad, will merge the old Sicad 1 (Around Bs. 12 per US$) and Sicad 2 (Around Bs. 50 per US$) into a single auction mechanism. This is impossible to judge at this time. First, we don’t know the level, it could be Bs. 12, it could be Bs. 40 or whatever. Somehow, I think it will be closer to Bs. 12 than to Bs. 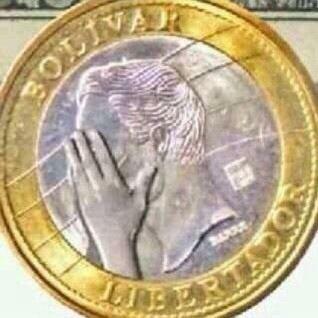 40, as President Maduro said yesterday that the oligarchy thought he was going to devalue to Bs. 40, but “he was driving them crazy”. Well, he is also driving himself deeply into a hole with his ignorance about these matters. In the end, for this rate, anything below Bs. 30-40 per US$ will do nothing to help in having more currency available overall, which should be the point of any new policy. Seems like a #FAIL, but until the Devil knows the details he will hold judgement and give the Government the benefit of the doubt. -The final one, which got everyone excited is that the Government plans to have a legal parallel system in which the price will somewhat determined by the laws of supply and demand in which people, companies, brokers, the Public Bolsa can participate and supervised by the Governemnt. Ummm, Where have I heard this before? Ahh! Yes! This is how Sicad 2 started, in the words of Rafael Ramirez, exactly one year ago and when implementation came around, it all became a Sitme-like system at a rate of Bs. 50 per US$ and subject to arbitrary criteria, unknown forces and preferential treatment. A waste of foreign currency in the end. But let’s assume and suppose that it will be almost free, the Government will impose lots of rules and regulations. It will impose daily limits etc. Then, the current parallel market will not disappear, there will be four rates of exchange with the “Dolar Today” rate surviving. This would be a #FAIL. Let us then assume that it will really be free, supply and demand, market forces and all of that. Will the current parallel exchange rate increase or decrease? Here is what I think: Initially, just like when Sicad 2 was announced the rate will go down. Because people truly think (and argue) that in a free market it will go down. First of all, it will take a while to set up this system. From what the Government has said, it will be a swap (permuta)-like system involving bonds . (What is this fixation with involving bonds, whatever happened to currency trading using currencies?) But it so happens that currently local brokers can not hold dollar denominated bonds. Thus, the Securities Law needs to be changed. Then, the Government has to decide how the market will function, hours, the like. This could take at least two or three months to be implemented. The parallel exchange rate is likely to move up as people lose patience. Then the market starts and this is where I have a few doubts that it will go down. How much money does the Government have to supply this “free” market? Given the shortage of currency, I don’t believe it has much. Additionally, there are many multinationals, that have not purchased a single dollar in the illegal market since May 2010. There were others that were not even buying then in the innocent belief that they would get their dollars at Bs. 4.3 per US$. Most of them in the face of a free and legal exchange will decide to repatriate at least some of the Monopoly money they have in Venezuela today. That is a lot of Monopoly money even at Bs. 200 per US$. People argue that the cash held by some companies becomes peanuts at Bs. 200. It may be so. But the cash held by many people and many companies, which have found it impossible to get their money out of the country for almost five years, can become a lot of money. Let me give you an example: Suppose the Government decides to sell US$ 2 billion at Bs. 150 (They will surely try to push the parallel rate down) right off the bat to “cool” off the market. At that price, this only suctions out of the system only 15% of M2 (Monetary Liquidity which is 2 trillion Bolivars today). Will the Government have or want to use another US$ 2 billion to keep it down at that time? Thus, the rate will go up. Thus, I am skeptical of how well it will work, more so since the Government has to provide lots of foreign currency at the other two lower rates. But, while this legal and free system may not help solving the problem of fewer dollars and may exacerbate other problems like inflation, I would welcome and approve this system. That’s the way it should always be. Ask the Swiss. But Maduro still thinks that there is something “modern” about the system he is planning to implement and that there is nothing less modern than controls. I actually wonder if he has realized that if there is legal and free system, then anyone importing at that rate can increase prices proportionately. What ever happened to controlling prices too? But multinationals are likely worrying already about taking the loss from Bs. 50 to the new parallel market. Ouch! The rest of the announcements did have specifics: Maduro plans to spend like a bandit and gave many specifics of new programs that add up to a significant fraction (6-7%?) of GDP. Go figure. Maduro did not mention a single number of all the funding that he claims he obtained in the trip. And given that 90 days ago Venezuela’s oil basket was close to US$ 80 per barrel, I wonder if a new economic plan will be needed at the time, since today’s cash flow is coming from those barrels sold three months ago. In April, it will be at a price below US$ 40 per barrel. And appealing to Maduro’s own speech: If God does not provide, who will he call upon to help? The pajarito*? Total increase 49.1% in nine weeks, I don’t even want to annualize it! The optimists would say inflation is slowing down. I imagine a Government official would even make a plot and show it. For now I keep measuring it and it does not look pretty. But, they are still delicious! Last week, the Swiss National Bank (SNB) a truly independent Central Bank, made the surprising decision to stop the “peg” it had with the euro at 1.2 euros per Swiss Franc. Essentially, in 2011, the Swiss Franc was appreciating very fast with respect to other currencies, which makes Swiss industry less competitive, and the SNB decided to establish a form of exchange control. In some sense, Switzerland “joined” the European Monetary Union by agreeing to have its currency pegged to the euro. Except that it did not work very well. As everyone expects some form of quantitative easing in the weeks ahead and some European may leave the Monetary Union, the Euro has been getting weaker against most currencies and in order to keep the peg, the SNB has been buying more and more euros, as nervous Europeans sought the safety of the Swiss Franc, as well as took advantage of the cheap interest rates for borrowing Swiss Francs. The topic also became a political issue, as a referendum was proposed (and defeated) by which the SNB would have had to increase the percentage of reserves it held in gold to 20%, as a way of protecting the value of the Swiss currency. Additionally, the Swiss economy was healthier than the European ones, growing faster and attracting even more money to Switzerland. There was little room to use interest rates to influence this, as interest rates were already negative (and are more negative now). Thus, the peg was removed and this rattled a lot of things, as the Swiss Franc exchange rate went from 1.2 to the euro to one to one with the Euro overnight, as the Swiss Franc revalued 16.7% with respect to the Euro…in minutes. First, it rattled speculators that were betting that the Swiss Franc would remain at the peg. It also rattled those that had borrowed in Swiss Francs and now owe more money due to its revaluation. And it rattled Swiss banks, many of which have property and investments outside of Switzerland, all of which will now have to register these properties and investments at the lower rate of exchange. But more importantly, it rattled Swiss industry, which will now find it harder to export (its main market) as well as seeing tourism diminished as it will be much more expensive for tourists to go to Switzerland. And what is the connection between this and the Bolívar? Simple, what the Swiss did was impose an artificial control on its foreign exchange markets in order to stop the revaluation of its currency, because it was bad for its industry. Except that the policy failed and the distortions became worse and worse as time went by. But rather than be afraid by not solving the problem and removing the control, the Swiss decided to swallow the bitter pill and let the currency float again. There will be pain now, but it will be eased in time. It would have been worse to keep the artificial policy on and wait a few years. This would have actually been bad for the Swiss Franc as it would have had even more euros in its balance sheet, some of which it would have had to invest in a currency that would be weaker and even in bonds that would change in currency in the future. It is the reverse problem Venezuela has: It imposed controls to stop the currency from devaluing, but the effects are the same, distortions and future problems when and if the controls are removed. The point and the connection is that these type of controls have never worked and even the Swiss Central Bank made the mistake of imposing them with known consequences. Some day the controls will be lifted in Venezuela and everything will be rattled for years to come. It used to be that a devaluation like that which will be necessary would benefit local production. Unfortunately, the destruction of local producers and manufacturers will make it difficult to have an impact right away. Years of distortions will take years of rebuilding, proving once again that such controls don’t work anywhere even in the short term. They did not work in Switzerland and do not work here. And as a famous Venezuelan politician said (Gonzalo Barrios? ): No somos suizos (We are not Swiss) implying we don’t do most things well. But in this case, both Central Banks erred, the Swiss were just capable of correcting their mistake. The word bizarre is no longer enough to describe what has been going n in Venezuela in the last few days. As the country was expecting for the much needed economic measures to be announced, instead, President Maduro announces that he is going on a trip. As he leaves, the usual shortages seeing in the country in the last two years intensify to the level of being widespread with long lines everywhere. The solution? In a country with the second highest homicide rate, the Government sends the military and the police to supermarkets and stores, as there are threats of looting reported by social media, while stores ban picture taking in their locales, under pressure by Government officials. This only increases tensions, as people are arrested for protesting and complaining in lines. Meanwhile, it turns out that Maduro took his family sightseeing to China on Government planes, which only irks people more. This simply echoes what his Ministers have been saying in Caracas for days. 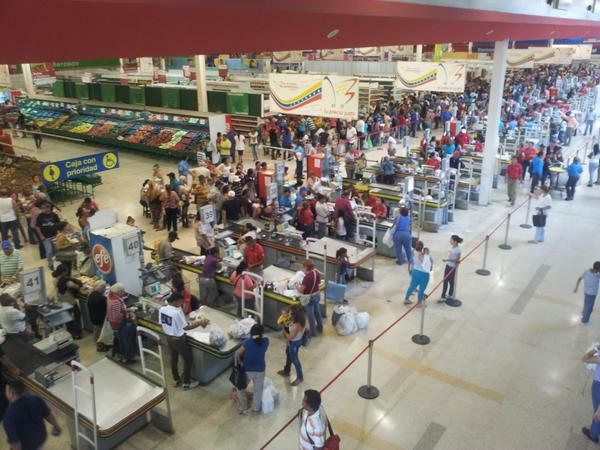 The leader of the farce is the Minister for Feeding Carlos Osorio who went as far as saying that the lines are there because people have stuff to buy in the stores. Then why do they create a rule that people must have a Venezuelan ID card to buy stuff? 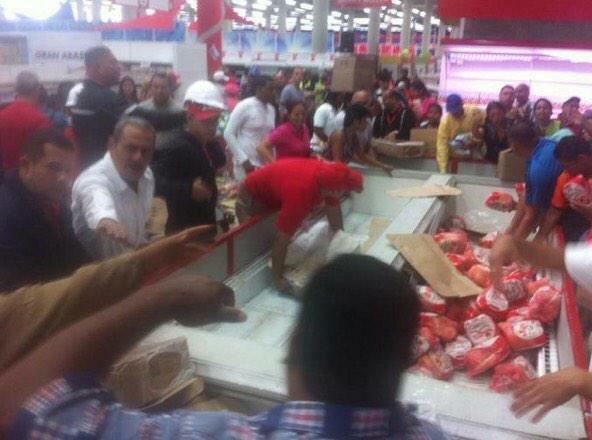 This is Osorio in a store trying to calm the people down, as you can see there are not that many chickens left and the people just overwhelm him, rushing to get the last chickens. And lest you think that the lines are localized, the website http://www.runrun.es did an interactive map showing how the huge lines were widespread from West to East in Caracas, independent of the standard of living of the people in the neighborhood. 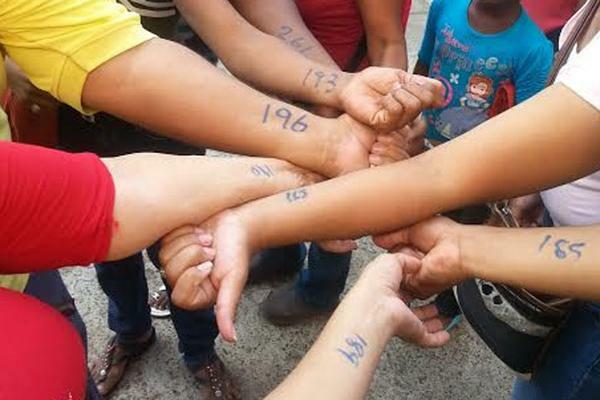 In Maracaibo the best idea is to write numbers of people on their arms to certify your location in the line. And people put up with it, as long as they can have some hope of getting the food they are seeking. Of course, the People’s Ombudsman, called the People’s Defender, says nothing about this, Human Rights be damned, they have been suspended in Venezuela for too long already. 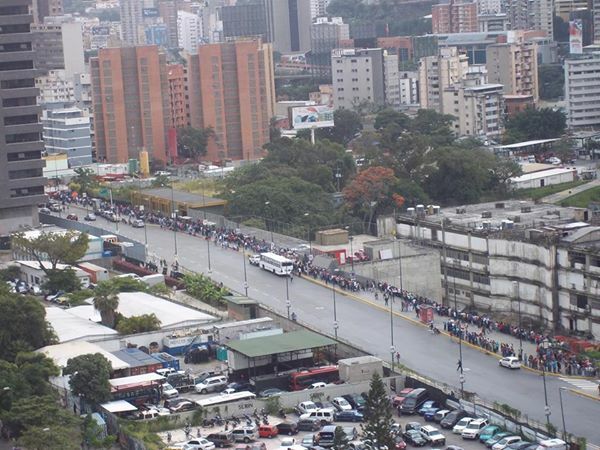 This was taken from afar, not only to attempt to get the magnitude of the line, something never seen in Venezuela EVER (before or after Chavismo), but also because if you take pictures up close you can be detained. 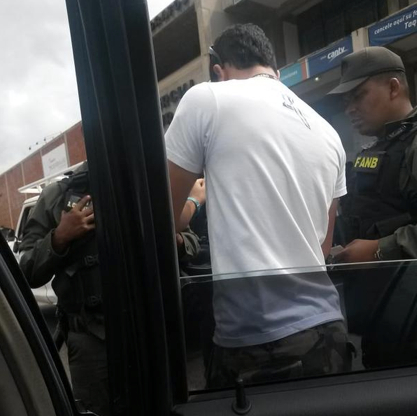 Like this reporter in Valencia (Andres Abreu @Andresabreu) being searched by the glorious Bolivarian National Guard for taking pictures of the lines in Valencia. Never mind the guarantees of free speech in the 2000 Venezuelan Constitution written by Chavismo. As if this was not enough, the Vice-President, who has the charisma of a featureless rock, says on TV that there are plenty of empty cells in Ramo Verde, where Leopoldo Lopez is being held, for those that dare to use political violence to upset the peace of the Republic. When pressured these guys can’t hide their fascists streak. Fascist is, fascist says. 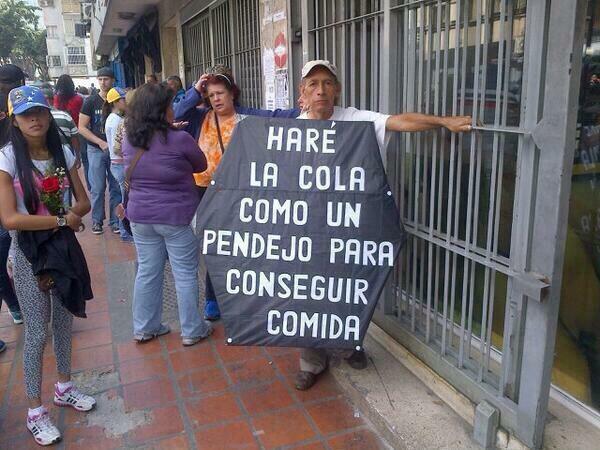 The result is that people are really pissed in Venezuela today. At Maduro, at the military, at the cops, at the supermarkets and their owners, at scarcity and at all the lies they keep feeding them in Government media. But Chavismo thinks that a President with 20% popularity can continue getting away with blaming the opposition for all the problems. Because this is not going away anytime soon. Price controls, exchange controls, absurd economic policies are coming home to roost. What is going on, is a reflection of the lack of foreign currency, for a Government used to solving supply problems with massive imports of scarce items. Except that the too many items are now scarce, national production has been decimated and the biggest scarcity is that of foreign currency. And neither the Chinese, nor the Russians, nor the Iranians, will give Maduro much at this time. And Maduro was really wasting his time in Saudi Arabia, rather than being in Venezuela facing and dealing with the real problems. He was not only undiplomatic, but also stupid, making this statement right before going to visit the Saudis. You don’t make a statement against your host, right before arriving to visit him. The Saudis have been repeatedly been very clear as to their intent to let the price of oil fall, come what may. I am sure the Saudis were nor precisely happy with Maduro aligning himself with their enemy to object the Saudi stance on oil production cuts. Maduro learned little while being Chavez’ Foreign Minister for seven years. And you really have to wonder if Maduro is so out of touch, or somebody or a group of somebodies is setting a trap up for him, telling him things are normal. Very few times have i felt Venezuela so close to turmoil and social unrest. Maduro is playing with fire and now reportedly he will not be back until Wednesday, as he continues touring OPEC countries in a hopeless cause. Who advised him to do it? How can he hope to get anything out of this, while things are almost out of control in Venezuela? In November I said that I feared we may be going into a period of chaos, unless the Government wants to use brutal repression to stop it. All signs point to that concern becoming a reality, but I would hate it to be the case. By now, even if the Maduro Government were to make the right decisions, it could take weeks for things to go back to normal. But either Maduro is more limited than I thought, or someone has been setting a trap for him ever since he was elected in 2013. And thus Venezuela has gone from being bizarre to bizarro, but where this all leads to is quite tricky and dangerous. With millions (yes, millions) of guns floating around the country and a disgruntled and hungry population, civil unrest and chaos could break out at any time. After that, it is anybody’s guess. Today there were two Tweets that were both clever, quantitative and, more importantly, completely true. Thus, I thought I would ask my readers to contribute tweets, that is, you have to say it in 140 characters, that are true, quantitative and describe some failure of the revolution. Better if they are clever and original in the sense that it is not a fact that is stated that often. The whole point is to get a collection of facts that people can easily remember and that are BS-proof. En 1999 un sueldo mínimo eran 20 barriles de a $10, ahora no llega a medio barril de a $50. @robertogozalez @moctavio @carlosblohm en 1999 la calificacion de PDVSA era A3, 15 años de socialismo despues es CCC+. Now is your turn…Tweet with my name on it or send it to devilexcrement@gmail.com and I will include it. En la 4ta NUNCA falto el pollo, nunca hubo escenas como esta del ministro @czosorio Hasta se exporto. In the Fourth Republic, chicken was NEVER scarce, there were never scenes like this of Minister Osorio @czosorio We even exported it. Every single one of the twelve years of this blog, I have wished my readers a Happy New Year. It was always a personal wish, hoping that every reader would have the best year they can hope for, for themselves and their families. Since we are all personally involved with Venezuela, this wish is very interconnected to the country and its future. Whether they are there or not, whatever happens in Venezuela in 2015 will have an undue influence on how good a year it is for each and all of us. Thus, when last night I sat down to wish you the best for the New Year, I just could not find a simple message. This is my more complete post about what I wish for all of you and for myself and my family. And why I think the word “happy” will be hard to apply to all of us in 2015. Unfortunately, I fear that 2015 will not be a good year for anyone connected to Venezuela. In fact, I expect 2015 to be THE annus horriblis for Venezuela. My only concern at this time, is that the slow pace of change in policies by the Maduro Government may extend the pain well into 2016 or even 2107, turning it into many anni horriblis, inflicting immeasurable pain on the Venezuelan people. Because the delay in new decisions will only exacerbate the effects of bad policies which will now be magnified by the sharp drop in oil prices, that will only intensify the effects of the upcoming crisis. And we all know and think about the first order effects of the upcoming crisis, like inflation, shortages, increased poverty and the like, but the second order effects are even scarier. Years of neglect have deteriorated the country’s infrastructure and the problems with electric power and water supply will take years to be solved. Quality of life will deteriorate, as people will suffer blackouts and brownouts for years and water rationing will become the norm. Crime will only increase and protests and unrest will become the norm. Unfortunately, in thinking about whether there was a possibility of having a “good” 2015 in Venezuela, the answer is that the panorama is quite fuzzy. As decisions are delayed, things will get worse, but they will not necessarily make a resolution to the problems be closer to reality. On the contrary, I believe the path that Chavismo will follow is to replace Maduro with someone else once his popularity reaches single digits, which will certainly occur in 2015. The fights within Chavismo will only intensify and Nicolas will be the loser, as most groups will realize a new face is the only possible way out for the Bolivarian revolution to survive. This, of course, is not a solution in the end, but a necessary step before real change can take place. But real change will not take place until Chavismo’s groups are atomized and its popularity, not that of its leaders, falls to levels similar to those of the opposition. And that, unfortunately, could take quite a while to take place. My best guess is that it will take at east two or three years for the country to reach that stage. There are no easy solutions in my mind. For change to take place there has to be a process, not an event. And with Chavismo’s resources and controls today, the process will be long and drawn out. And that is why it is hard to wish you a Happy New Year. My crystal ball suggests it will be anything but happy for Venezuelans, or those that care about the country, in 2015 and 2016. Thus, the best I can wish you is that I am wrong. However, I may be wrong about the details, Venezuela may have a Black Swan, but the path will certainly look similar to what I am depicting. And it will not be pretty, let alone happy.